These tasty bites are an amazing way to use up any cornflakes left at the bottom of the box, just add some Cajun spice and transform them into a delicious Southern style coating for chicken. Cut the chicken breasts into 8 strips. Place the cornflakes into a freezer bag and crush with your hands until the pieces are small but still crunchy. Add the Cajun spice and shake well until combined. Set out three small plates, one with flour mixed with black pepper, one with beaten egg and the remaining one with the crushed cornflakes. Dust each piece of chicken in flour then dip into the egg and finally press into the cornflake crumbs ensuring that the chicken is completely coated. Repeat with the remaining strips of chicken. Place the coated chicken onto a lightly greased non-stick baking tray and brush each with a little oil. Transfer to the oven and cook for 15-20 minutes until the coating is crisp and golden and the chicken is cooked. 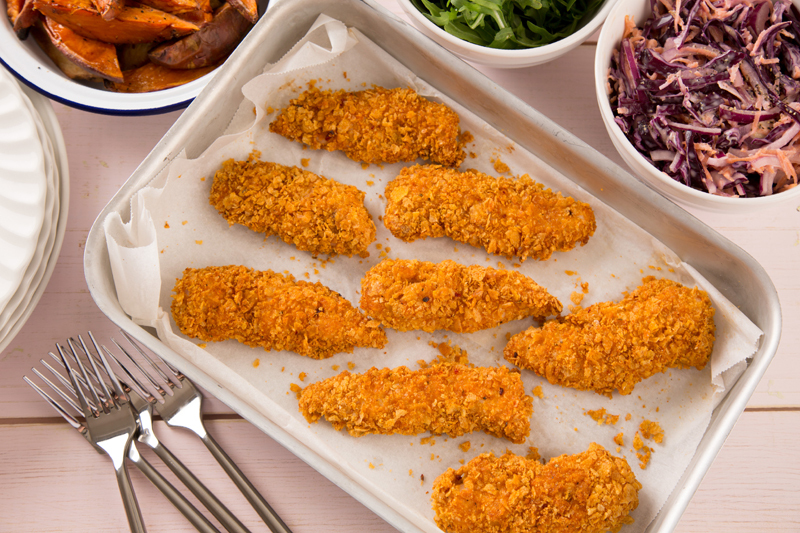 Try serving with sweet potato wedges and homemade coleslaw. If you would prefer to make your own Cajun spice try mixing ground coriander, cumin, chilli powder, and a pinch of salt. Try using different spices in the coating such as jerk seasoning or a Mexican spice mix. Vegetarian Options For a vegetarian option try using sliced firm tofu. Not suitable for vegans. Freezing and Storage Tips Not suitable for freezing. Store any leftover cooked chicken covered in the fridge and eat within 48 hours. This simple sponge pudding is a Blizzard family favourite.The sponge sits on a yummy layer of your choice and is perfect for using up all sorts of sweet foods. Hurrah! It’s Easter - a time of egg hunts, baby animals, fresh fluffy hot cross buns, delicious roast lamb, chocolate…chocolate, and well, more chocolate. Eventually, the mountain of chocolate that you’ve accumulated begins to get boring. The thought of another hot cross bun just doesn’t appeal. And the leftover roast lamb… isn’t there something else you can do rather than just have the same thing two nights in a row? Well, yes there is! There's always one bad apple that spoils the barrel, so keep an eye on your fruit, and separate out fruit which is ripening up more quickly than the others.